Lock in a great price for Carolina Resort by Valamar – rated 8.2 by recent guests! Nice views from the balcony, big spacious room and bed. Friendly and helpful staff. For me the food was very very good! Thank you Chef! The hotel is placed in a quiet area surrounded by pine tree. It was so relaxing.About the hotel I think it is a little bit outdated, room was big enough for a family , wi-fi works excelent . There is a parking area and big enough for everybody.The beach it is not for little kids because of the stones but hotel has a pool. All the staff who work here seem to be professional in his own way! The house itself is showing its age but not at all in a disastrous way... with the renovation for the next season that will become a number one place. Beaches and garden are perfect, the personal is friendly and helpful and the chefs are doing their best. Other than some signs of age here and there... nothing to complain. The staff is very professional and very, very friendly. great selection of food at the buffet, clean rooms, extra hospitality. Excellent location, beautiful beaches around the hotel, several beaches with easy access to the sea also with very young children (1-4 y). Pine trees offering shade. Marvelous view from balcony (and from beach). Friendly reception staff. Nice park. Carolina Resort by Valamar This rating is a reflection of how the property compares to the industry standard when it comes to price, facilities and services available. It's based on a self-evaluation by the property. Use this rating to help choose your stay! 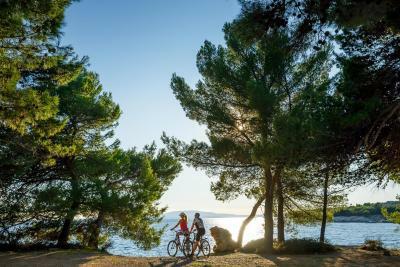 Offering outdoor pools with sun loungers and a buffet restaurant, Carolina Resort by Valamar enjoys a quiet location surrounded by a pine forest and a few steps away from the beach. The town Rab is 3.1 miles away. It offers air-conditioned interiors, an on-site bar and a tennis court. Facilities offered include entertainment staff, meeting rooms and a tour desk. A fitness centre and a spa centre with beauty treatments is available as well. An array of activities can be enjoyed on site or in the surroundings, including cycling, diving and mini golf. During summer months live music is organised at the hotel terrace. Rocky and pebbly beach are holders of an international Blue Flag award. Pula Airport is 40.4 miles away. When would you like to stay at Carolina Resort by Valamar? House Rules Carolina Resort by Valamar takes special requests – add in the next step! Carolina Resort by Valamar accepts these cards and reserves the right to temporarily hold an amount prior to arrival. Little outdated, but goes into renovation in 2019. Food OK, nothing special. The building infrastructure is a bit oldish: i.e. rooms not very new in style (though rather confortable); elevators' doors work in a chaotic way. Restaurant offer (half board) satisfactory, but not really charming. The coffee and juice for breakfast are of poor quality (you'd better get a coffie from the bar). Wifi very poor most of the time. Bedroom (unconfortable bed & very small bathroom). Bedroom view (swimming pull instead of sea, very noisy) This is far away from a real 4 stars hotel comfort. Croissant was not good as last year was. Mattress is a little "old"